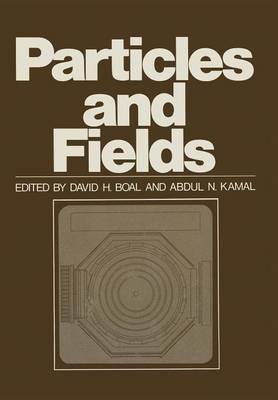 This volume contains the invited lectures and seminars presented at the Banff Summer Institute on Particles and Fields held at the Banff Center in Banff, Canada,from 25 August to 3 September, 1977. The town is situated in the heart of the Canadian Rockies, and the observant reader may notice references in this volume to the bears which roam near the town. The subject matter of the school was recent advances in particle physics and field theory. Lectures were given on such topics as extended objects, lattice gauge theories, quantum chromodynamics and Reggeon field theory. Experimental reviews were given of recent work in charmed particle and neutrino physics. Summaries of the theoretical implications of these experiments were also given. The format of the talks included eight lecture series (of three to four hours each) given by Profs. Abarbanel, Appelquist, Feldman, Gilman, 't Hooft, Jackiw, Mann and Weinstein, seven one-hour seminars given by Profs. Caianiello, Fujii, Johnson, Lam, Phillips, Sherry and Tze, and several short contributed seminars (which do not appear in this volume). There were also small informal seminar groups held at the Center and, we hope, many physics conversations on the hiking trails where most of the participants spent their afternoons. Not included in these proceedings are the banquet speeches by E. Caianiello and S. D. Drell, as well as (for copyright reasons) a seminar by K. Johnson.